Does anyone here know how to make Dresden Plate templates? I would like to have some different sizes without having to buy templates. Any help would be appreciated. Thanking you in advance. Have you tried Jenniepenny on QB? Google it. Then print one and enlarge it. I did it like that and made a couple different ones you can increase or decrease the size. I do that with and use template or cardboard. If you have the comic board paper they make decent templates. Shirt size gift boxes you can purchase for 3 or more in a pack (usually 6 pcs. lid and bottom) are really good for templates. I write on the templates the sizes and shapes. Some of the shapes can get one confused with the different triangles. I bought a dresden plate ruler - it works to make many different sizes. I bought one also, it is easy to use with the different sizes marked. If I am using the same size over and over for a project I put a piece of blue tape on the length I need and that makes it easy to cut the right size every time. I also googled dreseden plate pattern. There are many different templates from which you can choose! Are you using the Eleanor Burns method of making Dresden plate blocks? They are so easy and quick. The piece is just an angled wedge that I think could be made free hand. 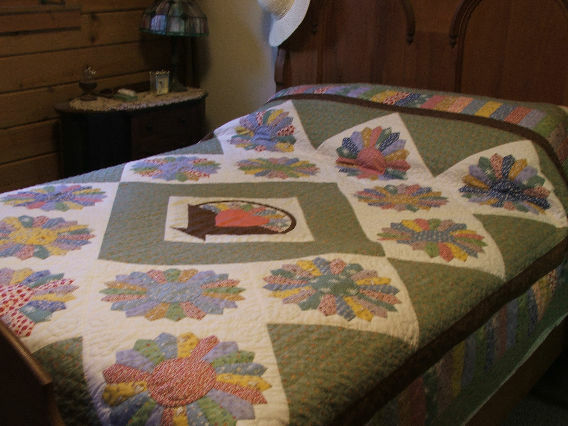 I have made several of those blocks and a quilt using them. If you'd like, I can see if I still have that template on my flash drive and email it to you. Let me know. Beautiful dresden quilt. I have the ruler and plan to make one as soon as I decide what colors I want to use. I have the ruler, and also have printed off different patterns that have different numbers of pieces in the plates. The ruler I think has 20, and I have printed some that have 12, 10 and I think 16. The angle for each is a bit different. I started cutting some many years ago with scraps of fabric using a printed pattern that I transferred to plastic. I have also bought the ruler that has a much different angle. That will be much easier to use than the template that I have. When I get a chance, I will see where I have printed off some of the patterns, and share the links. Can you fold a paper like you would for making snowflakes and cut your template to fit one section? Thanking everyone for their suggestions. Have found many websites with free templates, thanks to you all.